Caches are the faster memories that are built to deal with the Processor-Memory gap in data read operation, i.e. the time difference in a data read operation in a CPU register and that in the main memory. Data read operation in registers is generally 100 times faster than in the main memory and it keeps on increasing substantially, as we go down in the memory hierarchy. Caches are installed in the middle of CPU registers and the main memory to bridge this time gap in data reading. Caches serve as temporary staging area for a subset of data and instructions stored in relatively slow main memory. Since the size of cache is small, only the data which is frequently used by the processor during the execution of a program is stored in cache. Caching of this frequently used data by CPU eliminates the need of bringing the data from the slower main memory again and again which takes hundreds of CPU cycles. The idea of caching the useful data centers around a fundamental property of computer programs known as locality. Programs with good locality tend to access the same set of data items over and over again from the upper levels of the memory hierarchy (i.e. cache) and thus run faster. Example: The run time of different matrix multiplication kernels that perform the same number of arithmetic operations, but have different degrees of locality, can vary by a factor of 20! Temporal locality states that, the same data objects are likely to be reused multiple times by the CPU during the execution of a program. Once a data object has been written into the cache on the first miss, a number of subsequent hits on that object can be expected. 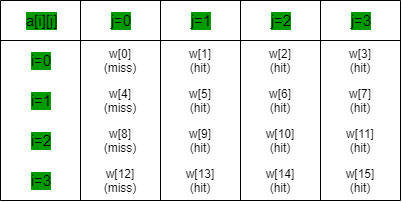 Since the cache is faster than the storage at the next lower level like the main memory, these subsequent hits can be served much faster than the original miss. It states that if a data object is referenced once, then there is a high probability that it’s neighbor data objects will also be referenced in near future. Memory blocks usually contain multiple data objects. Because of spatial locality, we can expect that the cost of copying a block after a miss will be amortized by subsequent references to other objects within that block. Locality in programs has an enormous impact on the design and performance of hardware and software systems. In modern computing systems, the locality based advantages are not only confined to the architecture but also, operating systems and application programs are built in a manner that they can exploit the locality to the full extent. In operating systems, the principle of locality allows the system to use main memory as a cache of the most recently referenced chunk of virtual address space and also in case of recently used disk blocks in disk file systems. Similarly, Applications programs like web browsers exploit temporal locality by caching recently referenced documents on a local disk. High-volume web servers hold recently requested documents in the front end disk cache that satisfy requests for these documents aithout any intervention of server. Frequently used cases need to be faster: Programs often invest most of the time in a few core functions and these functions in return have most to do with the loops. So, these loops should be designed in a way that they possess a good locality. Multiple loops: If a program constitutes of multiple loops then minimize the cache misses in the inner loop to alleviate the performance of the code. Assuming, the cache has a block size of 4 words each, word size being 4 bytes. 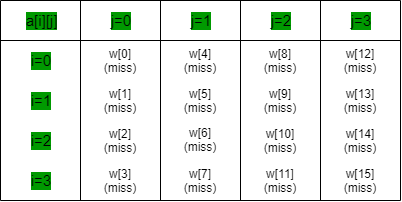 It is initially empty and since, C stores arrays in row-major order so the references will result in the following pattern of hits and misses, independent of cache organization. Example-2: Now, the sum_array() function sums the elements of a two dimension array in column-major order. As C stores arrays in row-major order but in this case array is being accessed in column major order, so the locality spoils in this case. the references will be made in order: a, a, a and so on. As the cache size is smaller, with each reference there will be a miss due to poor locality of the program. Hence, the hit ratio will be 0. Poor hit ratio will eventually decrease the performance of a program and will lead to a slower execution. In programming, these type of practices should be avoided. When talking about real life application programs and programming realms, optimized cache performance gives a good speedup to a program, even if the runtime complexity of the program is high. A good example is Quick sort. Though it has a worst case complexity of O(n2), it is the most popular sorting algorithm and one of the important factor is the better cache performance than many other sorting algorithms. Codes should be written in a way that they can exploit the cache to the best extent for a faster execution.